We believe children learn through play. A cooperative preschool is a nonprofit business owned and run by the parents or guardians of the preschool students. 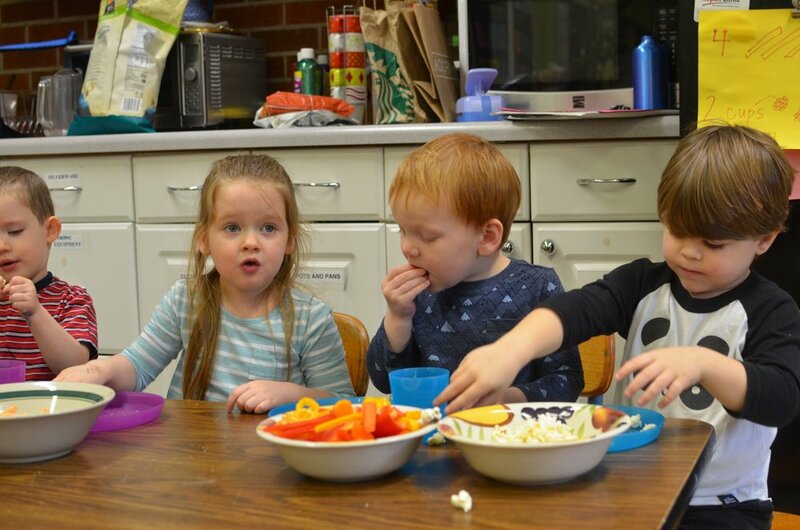 The preschool requires a commitment by parents/guardians to help in the classroom and provide other support to ensure that the school operates smoothly. Teacher Sam is the heart and soul of our classroom. Working closely with Teacher Sam, we all work together to make the school a supportive and challenging place for our children to grow. When you join a cooperative preschool, you really join a community and become an active participant in your child's education. As parents, we learn from Teacher Sam how to be an advocate for our children and to teach our children to use play to continue learning for the rest of their lives. Parents play an active role in the schools upkeep and management based on their abilities. Parents also help in the classroom - working alongside Teacher Sam. Parent involvement means tuition costs are significantly lower than a traditional preschool. Interacting with a community and receiving modeling by an experienced teacher gives parents opportunities to learn alongside their child. What is the philosophy of the preschool? Our curriculum encourages curiosity and love of learning by allowing students to investigate ideas and experiences which are meaningful for them. Our teacher helps children expand their ideas and encourages exploration. Our teacher sets age-appropriate curricula for the Caterpillar and Butterfly Classes. For example, in the spring the Butterfly Class investigates the concept of community: their role in the preschool community, others’ roles in the greater community (fire fighter, postal worker, librarian, and doctor) the location of their house, city, state, country. The children visit local businesses such as a grocery store and facilities such as a fire station as part of this unit. Yet, the teacher is flexible depending on the children’s interests, perhaps scheduling a visit to a farm or helping transform the dramatic play area into a hospital or restaurant. The classroom is organized into learning centers including Math and Science, Library, Writing, Dramatic Play, Invention Table, Art, Tactile Tables, and Construction. Children share their thoughts and experiences by creating books and journals with artwork, photos, and writing. The teacher reads to the children and encourages them to make up their own songs and stories. Circle time hones skills like listening to others, talking in turn and maintaining focus. The program becomes more structured and circle time becomes longer as the children move through the Caterpillar and Butterfly programs, but their days are ordered similarly. The children begin the day playing and acclimating themselves to the classroom. They transition to circle time to check in and talk about activities for the day, including special projects at the centers. The children move through the classroom and to the outdoor area during free choice period, and the Caterpillars come to the snack table when they are hungry. The Butterflies end free choice period by cleaning the classroom as a group and move into snack time. Another circle time follows. Each class spends time in the gym during gross motor skills time. Finally, the children return to the classroom for a song and goodbyes. What is a parent helper? Each day two parent helpers assist the teacher. They are required to be available for the children, provide snack food, and clean and tidy the classroom after each session. Parent Helpers are assigned to bring either a protein/carbohydrate or a fruit/vegetable, and the children drink water. Children in the Caterpillar Class sign up for snack time and come to the table when they are hungry. Butterfly Class children eat family style at a designated time. The preschool takes food allergies and diet limitations very seriously and strictly monitors what food comes into the classroom. We are a peanut free environment. What is the preschool’s philosophy on discipline? All children are different and learn to be part of the group at their own pace. Daily interaction with others provides many opportunities to teach conflict resolution. Children are encouraged to talk through conflict or move to a different activity. The teacher uses role play, books, and songs to teach respect for others, ways to handle feelings and impulses, and positive ways to interact with peers. Our teacher works with children and their parents to find strategies of encouraging positive behavior when the child’s actions are excessively disruptive or harmful to others. Must a child be toilet-trained? No. Parents work with the teacher to develop a plan and assist children with accidents. However, you must come to the preschool to change your child’s diapers. Irvington Preschool’s goal is to provide a stimulating and creative learning environment that encourages the development of each childs positive self-image and social skills through both structured and unstructured play experiences in the areas of art, music, science, physical education, dramatic play, and reading and math readiness. To enhance these experiences, the curriculum utilizes community resources in and outside the classroom. The curriculum is child-directed with learning goals that are related to the expressed interests of the children. The classroom is full of open-ended art activities, sensory opportunities, and plenty of free movement from one learning center to another. Children are encouraged to explore and build upon the activities in the classroom. The class engages in projects with planning and in-depth investigation where children can focus on the aspects of a subject that are meaningful to them. Children experiment with writing by using a variety of writing materials such as notebooks, pens, markers, typewriter, stamps, envelopes, and stickers. Children enjoy building creative structures with wooden and plastic blocks of various sizes, shapes and colors. While building, children are exposed to concepts such as patterns, symmetry, balance, and building strategies. The library is a comfortable area where children find a restful haven for exploring books. The teacher or parent helper may read to a group of interested children, and children may also read their own book, share a book with a friend, or listen to a book on tape. The preschool maintains a children’s library from which children may check out books to take home. Children experience fun tactile learning while playing in one of three sensory tables. Cups, shovels, containers, and toys are used in sand, water, dirt, pebbles, or ice, while play dough, finger paint or shaving cream is molded, spread, or squished. These tables encourage conversations, collaboration, questioning on how the world works, and problem-solving. Children create wonderful masterpieces by using material such as paints, markers, clay, pipe cleaners, glue, glitter, and scissors. During this process children are expressing themselves, solving problems, and learning an appreciation for art. The emphasis is on the artistic process, rather than the final product. Children use material such as interlocking plastic blocks, puzzles, beads, and lacing cards to discover early math concepts like size relationships and patterns and develop visual and spacial awareness. Today, your child may be a firefighter, tomorrow a cook. With an assortment of hats, costumes, kitchenware, and props such as phones, dolls, puppets, and food, your child can find out what it is like to be in someone else’s shoes. Children use tools like magnets, magnifying glasses, eye droppers to explore objects such as plants, animals, shells, and leaves. Here students are encouraged to observe, question and predict. Children always have access to an outdoor play area, which includes a play structure, sandbox, and small garden. The main components of the daily schedule are student-choice time, snack, whole group music or story, and gym. Two parent helpers assist the teacher in the classroom daily. Caterpillars attend Tuesdays and Thursdays 9:30a-1p. Butterflies attend Monday, Wednesday, and Friday 9:30a-1:30p. Lunch- Both classes include time for lunch, please send your child with a peanut free lunch each day. Alternate pick up times can be arranged for kiddos who aren’t quite ready for a long morning. Parents are required to help in the classroom on a rotating basis as assigned on the monthly calendar. Parents have a job that helps the school and provides a unique way to get to know other parents. Parents will have an opportunity to rank preferences for committee assignments before the school year starts. General Membership Meetings are generally held the fourth Wednesday of each month in the Fellowship Hall (the “gym”) or the Fireside Room. At least one parent from each family must attend each general membership meeting. You can read more about being a part of our community in our handbook here. We are now enrolling for the 2019-2020 school year! For a tour and more information please contact us at, irvingtonpreschool@gmail.com or call 503-287-3288. Interested families should fill out and send the Enrollment Application for new families. Returning families should fill out the Enrollment Application for returning families. Please also complete a Family Information Form.